The Free Press Journal, Mumbai, India. Son of legendary magician late PCSorcar, Manick Sorcar chose animation to cast a magic spell on his viewers. Based in Denver, USA, this lighting design engineer has won many awards for his works that often premier to the Western world the richness of Indian fables. 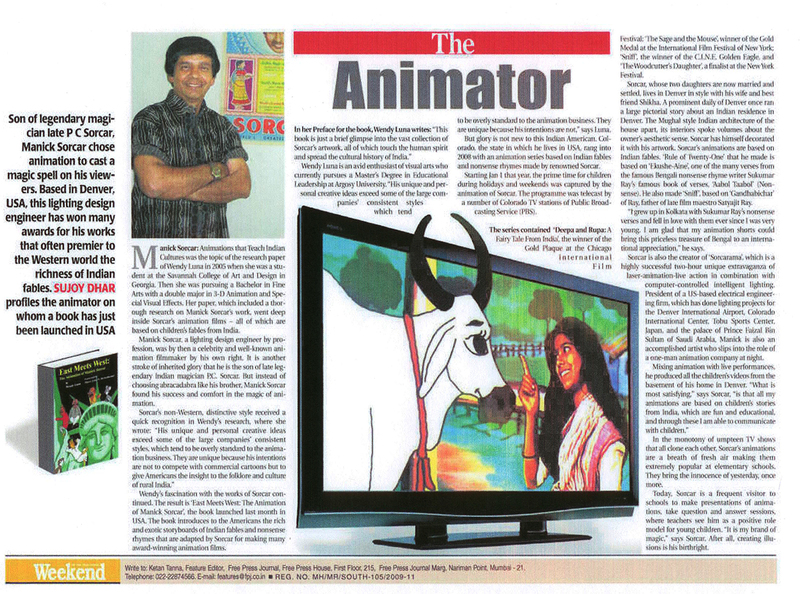 SUJOY DHAR profiles the animator on whom a book has just been launched in USA. 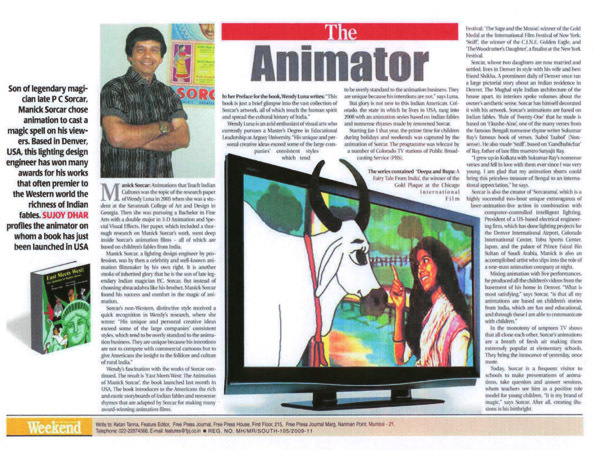 "Manick Sorcar: Animations that Teach Indian Cultures" was the topic of the research paper of Wendy Luna in 2005 when she was a student at the Savannah College of Art and Design in Georgia. Then she was pursuing a Bachelor in Fine Arts with a double major in 3- D Animation and Special Visual Effects. Her paper, which included a thorough research on Manick Sorcar’s work, went deep inside Sorcar’s animation films – all of which are based on children’s fables from India. Manick Sorcar, a lighting design engineer by profession, was by then a celebrity and well- known animation filmmaker by his own right. It is another stroke of inherited glory that he is the son of late legendary Indian magician P. C. Sorcar. But instead of choosing abracadabra like his brother, Manick Sorcar found his success and comfort in the magic of animation. Sorcar’s non-Western, distinctive style received a quick recognition in Wendy’s research, where she wrote: “ His unique and personal creative ideas exceed some of the large companies’ consistent styles, which tend to be overly standard to the animation business. They are unique because his intentions are not to compete with commercial cartoons but to give Americans the insight to the folklore and culture of rural India.” Wendy’s fascination with the works of Sorcar continued. The result is ‘ East Meets West: The Animation of Manick Sorcar’, the book launched last month in USA. The book introduces to the Americans the rich and exotic storyboards of Indian fables and nonsense rhymes that are adapted by Sorcar for making many award- winning animation films. In her Preface for the book, Wendy Luna writes: “ This book is just a brief glimpse into the vast collection of Sorcar’s artwork, all of which touch the human spirit and spread the cultural history of India.” Wendy Luna is an avid enthusiast of visual arts who currently pursues a Master’s Degree in Educational Leadership at Argosy University. “ His unique and personal creative ideas exceed some of the large companies’ consistent styles which tend to be overly standard to the animation business. They are unique because his intentions are not,” says Luna. But glory is not new to this Indian American. Colorado, the state in which he lives in USA, rang into 2008 with an animation series based on Indian fables and nonsense rhymes made by renowned Sorcar. Starting Jan 1 that year, the prime time for children during holidays and weekends was captured by the animation of Sorcar. The programme was telecast by a number of Colorado TV stations of Public Broadcasting Service ( PBS). The series contained ‘ Deepa and Rupa: A Fairy Tale From India’, the winner of the Gold Plaque at the Chicago International Film Festival; ‘The Sage and the Mouse’, winner of the Gold Medal at the International Film Festival of Newyork; ‘Sniff’, the winner of the C.I.N.E. Golden Eagle, and ‘The Woodcutter’s Daughter’, a Finalist at the New York Festival. Sorcar, whose two daughters are now married and settled, lives in Denver in style with his wife and best friend Shikha. A prominent daily of Denver once ran a large pictorial story about an Indian residence in Denver. The Mughal style Indian architecture of the house apart, its interiors spoke volumes about the owner’s aesthetic sense. Sorcar has himself decorated it with his artwork. 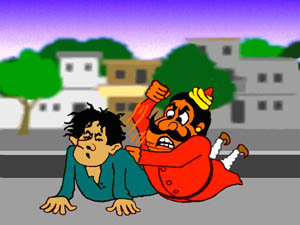 Sorcar’s animations are based on Indian fables. ‘Rule of Twenty-One’ that he made is based on ‘Ekushe- Aine’, one of the many verses from the famous Bengali nonsense rhyme writer Sukumar Ray’s famous book of verses, ‘ Aabol Taabol’(Nonsense). He also made ‘Sniff’, based on ‘Gandhabichar’ of Ray, father of late film maestro Satyajit Ray. “ I grew up in Kolkata with Sukumar Ray’s nonsense verses and fell in love with them ever since I was very young. I am glad that my animation shorts could bring this priceless treasure of Bengal to an international appreciation,” he says. Sorcar is also the creator of ‘ Sorcarama’, which is a highly successful two- hour unique extravaganza of laser- animation- live action in combination with computer- controlled intelligent lighting. President of a US- based electrical engineering firm, which has done lighting projects for the Denver International Airport, Colorado International Center, Tobu Sports Center, Japan, and the palace of Prince Faizal Bin Sultan of Saudi Arabia, Manick is also an accomplished artist who slips into the role of a one- man animation company at night. Mixing animation with live performances, he produced all the children’s videos from the basement of his home in Denver. “ What is most satisfying,” says Sorcar, “ is that all my animations are based on children’s stories from India, which are fun and educational, and through these I am able to communicate with children.” In the monotony of umpteen TV shows that all clone each other, Sorcar’s animations are a breath of fresh air making them extremely popular at elementary schools. They bring the innocence of yesterday, once more. Today, Sorcar is a frequent visitor to schools to make presentations of animations, take question and answer sessions, where teachers see him as a positive role model for young children. “ It is my brand of magic,” says Sorcar. After all, creating illusions is his birthright. Note: The entire original news can be found here.